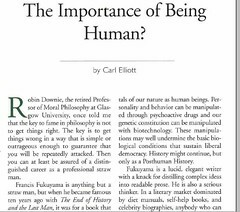 I'm currently writing a chapter for Ruth Chadwick and Bert Gordijn on the history of posthumanism and while going through my archives I discovered this brief review of Fukuyama's 'Our Posthuman Future'. It is published in The Hastings Center Report and I felt like writing something about it. Actually, it made me think about putting together a 'Coincidences' category here. Robin Downie is Profesor Emeritus at Glasgow Uni where I have just completed an MPhil in Medical Law and Ethics. I met Robin when I first moved to Glasgow and was put in touch with him by Carl Elliott, author of this article. I met Carl in 1999 at a meeting of his Enhancement Technologies Group at UCL. In this article, Carl is reviewing Francis Fukuyama's book. I developed a communication with Fukuyama in 2004, around the time of publishing Genetically Modified Athletes, since in The Economist's Year in 2003, he published a piece on GMAs. In 2002, I was based at the Hastings Center as an International Visiting Scholar. During this period, I met Tom Murray, President of the Center and author of the Foreword for my book.